Ace Attorney Investigations: Miles Edgeworth, an investigation-heavy Nintendo DS title first released in Japan, will be coming to the U.S. this winter. In Investigations, the game is more about the crime scene and less about the courtroom. Players will take on the role of prosecutor Miles Edgeworth as he investigates crime scenes in his search for the truth. Players will control Edgeworth on the crime scene searching for contradictions. They will also identify clues and question material witnesses using collected information, gathered evidence, and "logic". 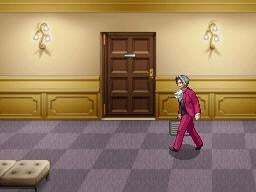 The game includes several episodes, kicking off with a murder in Edgeworth's office. In the first episode, an argument in Edgeworth's office results in a mysterious murder. Edgeworth, coming back from a one-month business trip, enters his office and encounters the body of the man who was shot. He is then threatened by someone who is presumed to be the suspect with a gun from behind. In the second episode, Edgeworth wakes up after being knocked out due to an air pocket accident inside a luxury airliner flying through turbulence. Shaken by the flashback of nightmarish past memories, he opens the onboard elevator's door, only to find a male corpse. At this very moment a cabin attendant witnesses the scene and Edgeworth is made a suspect of murder! Capcom says the Teen-rated Ace Attorney Investigations: Miles Edgeworth will include more than 15 hours of gameplay.